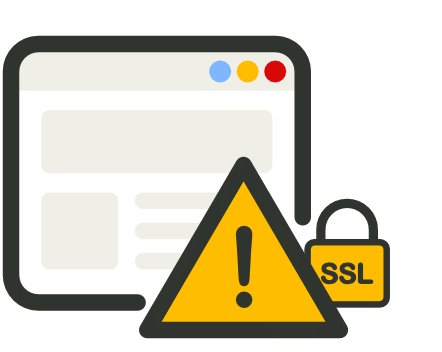 When you visit a website running over HTTPS a series of steps are performed between the browser and the web server to ensure the certificate and SSL/TLS connection is valid. Some of these include the TLS handshake, the certificate being checked against the certificate authority, and decryption of the certificate. If for some reason the browser doesn’t like what it sees, such as a misconfiguration or unsupported version, your browser might display the following error: “ERR_SSL_VERSION_OR_CIPHER_MISMATCH” which prevents you from accessing the site. Check out a few recommendations on how to fix this error. The ERR_SSL_VERSION_OR_CIPHER_MISMATCH error typically happens on older operating systems or browsers. But that is not always the case. 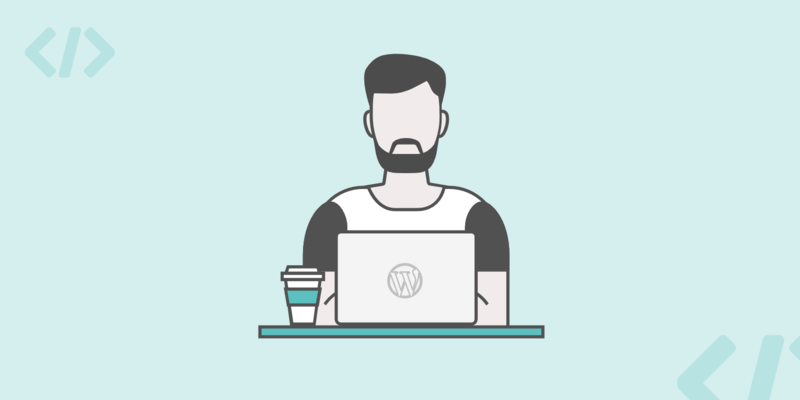 In fact, we just recently encountered a user having this issue on their WordPress site who was migrating to Kinsta from another host. We were, of course, running the latest version of Chrome, so the issue was with their SSL certificate. Chrome is actually protecting you by not letting you load it. Check out reasons below on why this happens and what you can do about it. If you see this error, the first and easiest place to start is to perform an SSL check on the certificate that is installed on the site. 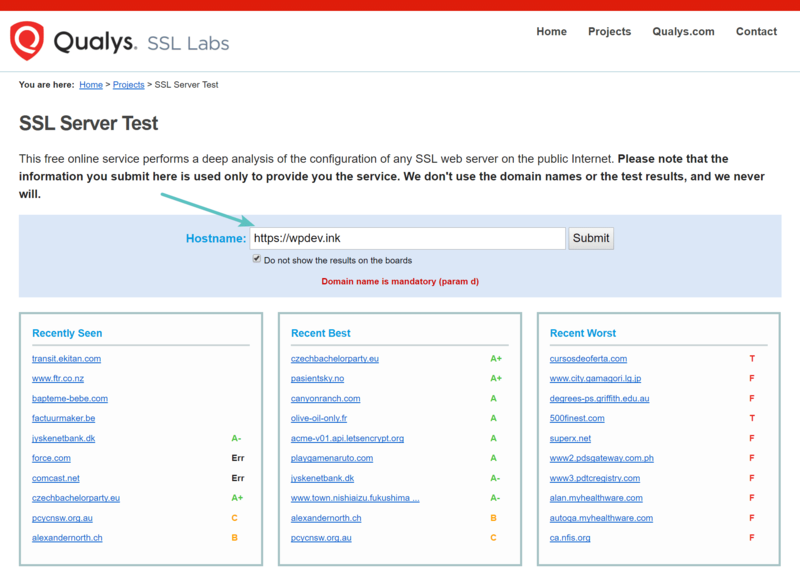 We recommend using the free SSL check tool from Qualys SSL Labs. It is very reliable and we use it for all Kinsta clients when verifying certificates. Simply input your domain into the Hostname field and click on “Submit.” You can also select the option to hide public results if you prefer. It could take a minute or two to scan your site’s SSL/TLS configuration on your web server. The site does not use SSL, but shares an IP address with some other site that does. The site no longer exists, yet the domain still points to the old IP address, where some other site is now hosted. The site uses a content delivery network (CDN) that doesn’t support SSL. The domain name alias is for a website whose name is different, but the alias was not included in the certificate. Another easy way to check the current domain name issue on the certificate is to open up Chrome DevTools on the site. 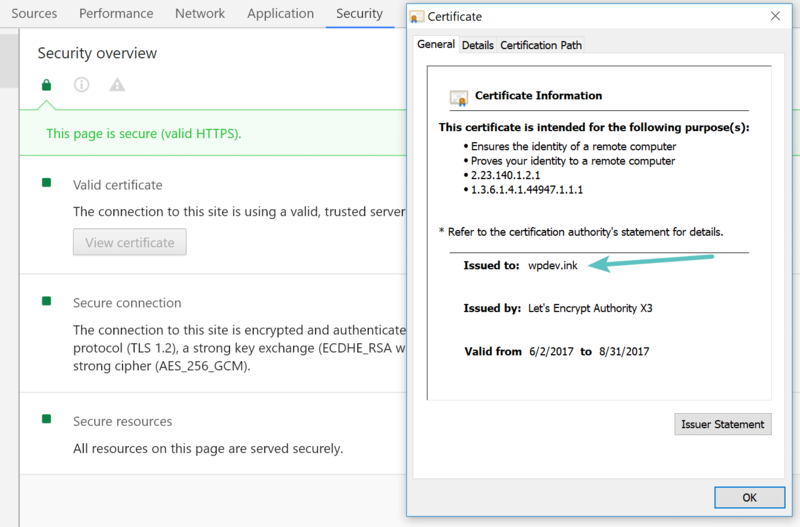 Right-click anywhere on the website and click on “Inspect.” Then click on the security tab and click on “View certificate.” The issued domain will show in the certificate information. If this doesn’t match the current site you’re on, this is a problem. 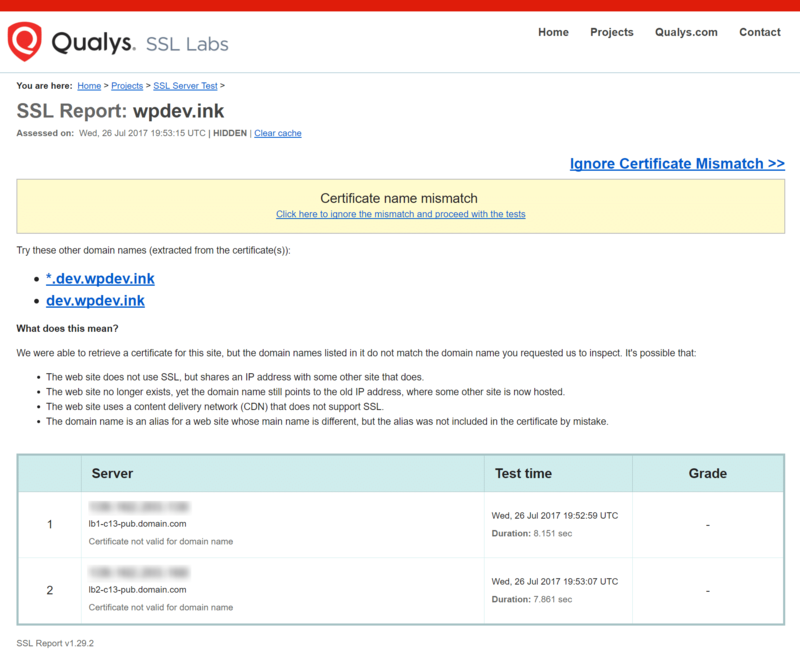 Remember though, there are wildcard certificates and other variations, but for a typical site, it should match exactly. However, in our case, the ERR_SSL_VERSION_OR_CIPHER_MISMATCH error actually prevented us from being able to check it in Chrome DevTools. That is where a tool like SSL Labs can come in handy. Another possible reason is that the TLS version running on the web server is old. Ideally, it should be running at least TLS 1.2. If you are a Kinsta customer you never have to worry about this as we always upgrade our servers to the latest and greatest supported versions. This is something the SSL Labs tool can also help with. Under configuration, it will show you the current version of TLS running on the server with that certificate. If it is old, reach out to your host and ask them to update their TLS version. Don’t forget that TLS 1.3 is also something to look forward to. Then change the maximum TLS version enabled from default to TLS 1.3. Another reason according to Google’s documentation for ERR_SSL_VERSION_OR_CIPHER_MISMATCH is that the RC4 cipher suite was removed in Chrome version 48. This is not very common, but it could happen in say larger enterprise deployments that require RC4. Why? Because everything usually takes longer to upgrade and update in bigger and more complex configurations. Security researchers, Google, and Microsoft recommend that RC4 be disabled. So you should make sure the server configuration is enabled with a different cipher suite. You can view the current cipher suite in the SSL Labs tool (as seen below). Click the Google Chrome – Settings icon (Settings) icon, and then click Settings. Under Network, click Change proxy settings. The Internet Properties dialog box appears. 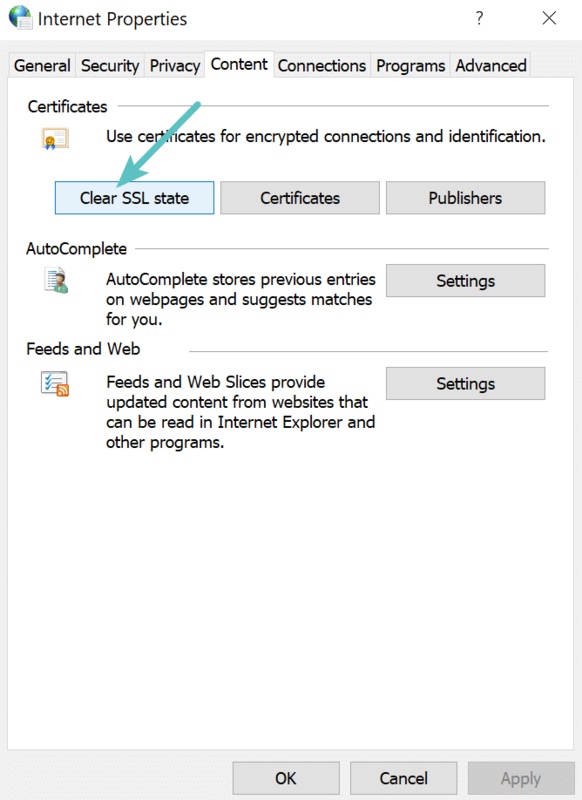 Click “Clear SSL state”, and then click OK. If you are on a Mac, see these instructions on how to delete an SSL certificate. Older operating systems fall out of date with newer technologies such as TLS 1.3 and the latest cipher suites as browsers stop supporting them. Specific components in the latest SSL certs will simply stop working. Google Chrome, in fact, pulled the plug on Windows XP back in 2015. We always recommend upgrading to newer operating systems if possible, such as Windows 10 or the latest version of Mac OS X. The last thing we recommend trying if you are still seeing the ERR_SSL_VERSION_OR_CIPHER_MISMATCH error is to ensure you don’t have an antivirus program running. Or try temporarily disabling it. Some antivirus programs create a layer between your browser and the web with their own certificates. This can sometimes cause issues.